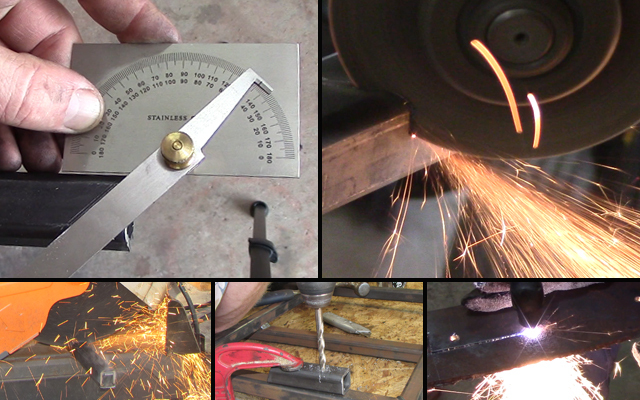 Cutting steel for the go kart build can be done in many different ways. I'll show you how to do it with four different methods. First, mark the steel, then drill out any holes for tabs, then cut out the dimensions for the brackets and tabs. For tubing, cut the lengths, and angles. 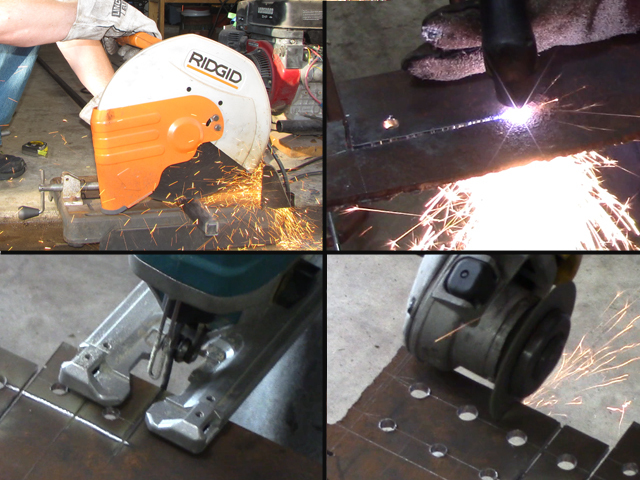 If you focus on cutting all the steel plate and tubing first, you will be more efficient and finish faster! Marking steel is done with a straight edge and a marking tool. The straight edge can be your square, or protractor. Because steel comes with rust or mill scale, a pen or pencil is hard to see when cutting and may not be visible. 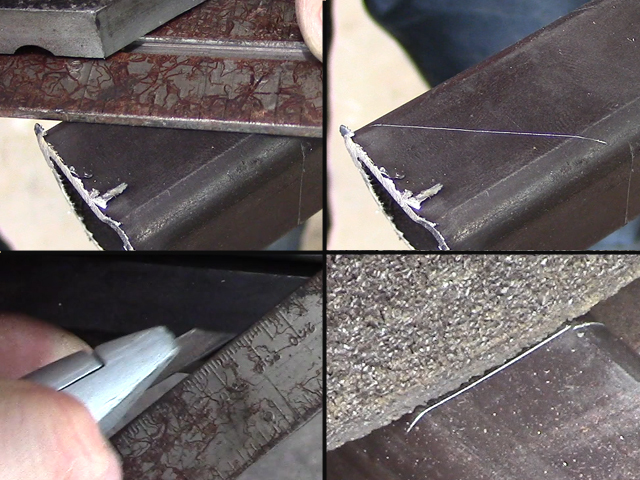 Many welders use soap stone because it marks well, and shows up under an auto-darkening welding hood when in cut/grind mode. I chose a different path, and used a razor blade in a sheet-rock knife to do the marking. It gives a precise line and shows up well under my garage lights. For more precise cuts, I choose which side of the line to cut as the cut off wheel is about 1/8″ thick. I suggest marking all of the tabs and brackets from a 3/16″ plate all at once. Hold a center punch over the steel, and hammer the end to make a divot. This prevents the drill bit from ‘walking’ or moving along the steel as you start to drill the hole. Use the actual size drill bit, to drill out the pilot hole. Chop Saw: This is great for cutting tubing, and angles up to 45 degrees on tubing, but is not going to work when cutting a large section of plate. The angle grinder can do the job of a chop saw with more precision if you mark your steel correctly. Plasma Cutter: This is used to cut thick and thin metal by melting it with plasma, then blowing it away. You hold the torch with your hand and it cuts in any pattern you can move your hand to. A plasma cutter costs a lot of money, and you don’t need to cut anything but straight lines with this build. Jig Saw or Reciprocating Saw: I use this mainly for wood working, and it can cut plate relatively well with no dust or funny smelling fumes. A reciprocating saw can be used with metal cutting blades. Cutting with either of these tools is great with steel plate, but will be sloppy on tubing, and will be a huge hassle. Angle Grinder: This is the one tool to have as you can use it for the entire build, it is cheap, and does the job of all of the above tools, plus it can sand, grind, polish, and scuff up the metal surfaces. It cuts fast, and wheel attachments are cheap. I used a 4 1/2″ angle grinder for almost all of my cuts. Once you have your cuts made, the metal may have little slivers of metal that were nor removed during the cut (called burrs). You can easily remove burrs by running a wire wheel on your angle grinder over them. 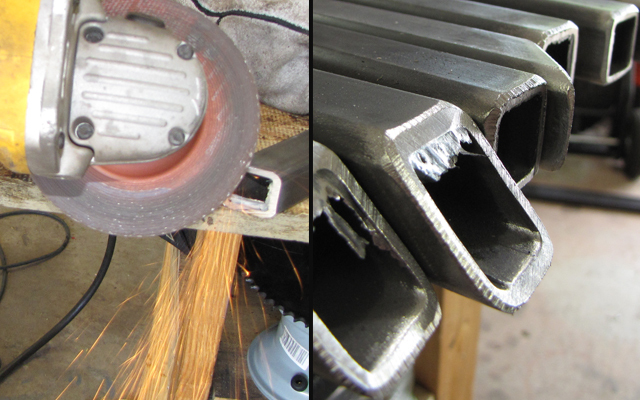 If you have a small welder, you can bevel and deburr the edges of the steel for better fitment and weld penetration. Beveling the edge of the tubing is usually done at a 30 to 45 degree angle to the cut where two pieces of tubing will be welded together. To make a bevel, simply put a grinding wheel on your angle grinder and grind off an angled portion of the edge to be welded. Now that you have all of your steel cut and prepped for welding, let’s start putting this steel together and welding it up! I find your plans through youtube which is a great project to work with my sons. I find a laser cutter so it would be much more easy to do the plate cutting and drilling but for laser cutter they ask for the file instead of jpg. is it possible to mail me this file so that we can work with laser cutter? Many thanks, I think what you’ve already done is fantastic so making it easier on the novice can only improve the experience! As to that outer dimension, I feel like I am missing something. When I look at page 9 is see the 1′ 8″ marking the front of the floor pan up by that area but I don’t see the 1’9″ you referenced. I am referencing page 7 and it would appear that the outer dimensions of the left and right side bars are indeed 1’9″ apart but the leading edge of the bumper appears to be visually something less than 1’7″ on the long side of each 22.5 degree angle cut. Sorry for being a pain, just want to cut it right the first time. The go kart is 1″ wider than the floor pan so you can weld the floor pan to the bottom of the kart. As for the bumper, it is just as wide as the kart itself. Its right there in the plans with the exact outer dimensions of each section of the bumper. You are really overthinking it. Just cut to specs and it will all work out. So with the 22.5 degree cut, that is half of the 45 degree angle. A few people have gotten caught up on that, so think of it this way: if you are wanting a 45 degree angle, you divide it in half, and that is the angle that needs to be cut (22.5+22.5=45). If anything, you may screw up the angle cuts as people measure the angle from the wrong side of the steel. Got it, thanks! Yes, I did jack up the 22.5 degree at first but mocked it up in wood until I figured our where I was screwing up. It’s coming together now. Thanks again for your prompt support and patience! its all in the plans, just click on the links to the plans and its on the table of parts. it will be coming right up, I emailed you as well. thanks for the input! hey kartfab great build. 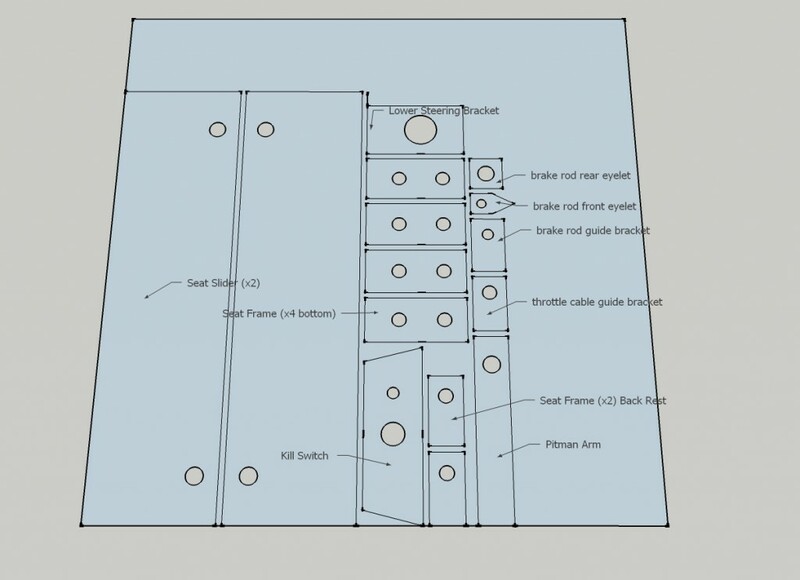 can i also have the 3/16″ plate as it is layed out for cutting also. Other than that, the plan is excellent, easy to read. my son and i are enjoying father / son time thanks to your work. thank you. No problem, the plate should be a 12″x12″ plate and have plenty of wiggle room for cutting. I didnt put dimensions on the picture as it would be illegible. How can I also get that little tidbit of info. I am still in the “cutting” phase and I haven’t found a good reference of exactly what shows on that picture of the 3/16″ plate. Same for measurements as well. Sorry, should have stated more clearly…it would be nice to have a table of the items to be cut from the 3/16″ plate with dimensions so that cutting them all at once is easy to do. Lastly, what is the outer dimensional length of the very front bumper bar that ends in 22.5 degree angles at each end? I’ll be updating the plans by the end of July. It wont change the actual kart, but make it easier to follow with links back to individual videos and webpages for each section of the build. I’ll include a picture of that layout at that time. Outer dimensions (width) from outside edge to outside edge is specified on page 9 (1’9″).